Get 6 essential setting resources and 2 beautiful projects at one low price--but only for a limited time! Boost your stone-setting skills with this exclusive bundle. . .
Get 4 essential setting resources and 2 beautiful projects at one low price--but only for a limited time! includes essential how-tos EVERYONE should have. Compiling 144 minutes of video instruction and 350+ pages of stone setting how-tos, this combo pack is the ultimate must-have for stone-setting information! 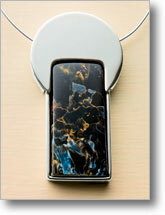 Boost your skills; become familiar with different bezels, and become a stone-setting pro! 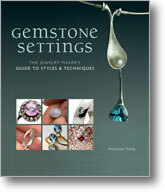 Get ready to set your stones in style with this in-depth, technical guide to stone setting. Fall in love with this encyclopedic overview, which features extensive stone-setting processes, detailed information about stones and metals, and gorgeous photos and illustrations for visual support. Learn step by step, how to set your most beloved precious, semiprecious, and organic stones with projects that range from elegant diamond masterpieces to earthy pearl or coral everyday favorites. Boost your skills with a comprehensive lesson in one of the fundamental jewelry techniques, bezel setting. Join artist and experienced metalsmith Lexi Erickson in 11 watch-and-learn lessons for everything you need to know to take your stone setting to the next level. Expand your jewelry-making repertoire with how-tos for setting round stones, rounded squares, stones with sharp corners, stones with oblique angles, high-domed stones, thin stones, stones with natural edges, and more--plus learn how to select the right bezel wire or flat sterling wire for each stone! Take your metal jewelry making to the next level with 10 beautiful bezel projects. Create your own work of wearable art with step-by-step projects to display those lovely gemstones you've been holding onto. Boost your bezel-setting skills with 10 More Bezel Setting Projects, an instant download eBook from the trusted editors of Lapidary Journal Jewelry Artist magazine. Craft the perfect design for facets, cabochons, silver, or gold. 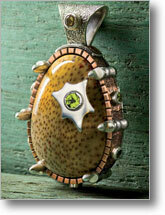 Be inspired to create your own unique bezels with your favorite stones today! Learn bezel basics from master gem expert Michael Boyd to brush up on your stone-setting skills. Whatever your style of skill level, you'll find inspiring designs and techniques to implement in every project! Get instant access to stunning projects and expert how-tos as you master 10 popular designs. Create the perfect piece with helpful hints and step-by-step instructions. Use endless variations to create even more one-of-a-kind designs! 10 Wire Bezel Projects for Your Favorite Cabochons is an instant download eBook filled with 10 wire bezel designs, exclusively from the trusted experts at Step by Step Wire Jewelry magazine! Weave, wrap, and twist your way to beautiful dramatic bezels with these 10 inspiring designs. Wrap gold wire around a pearl cabochon to make a classic bezel, alternate jump rings and beads to create a funky, fun bezel design, twist wire around chunky turquoise to make a stunning bold look even Cleopatra would wear, and more! Plus, access 2 additional projects perfect for showing off your stone-setting skills!